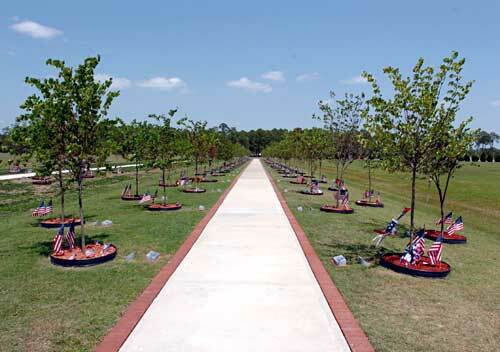 Warriors' Walk: A Memorial to the Fallen At Fort Stewart in Georgia, a tree-lined field known as Warriors' Walk stands as a memorial to the fallen. Nearly 300 red buds have been planted along the road, each representing a soldier from the Army's 3rd Infantry Division who has died in Iraq since 2003. Red buds planted along Warriors' Walk. 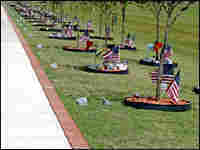 Each one represents a soldier from the 3rd Infantry Division who has died in the Iraq war. Nearly everyone I talked with in Hinesville, Ga., knows someone at Fort Stewart. They have stories about the war to share; about their husbands or friends who have spent time in the Iraq desert. Soldiers talk about how all that dry heat takes some getting used to and how, now that they are back, small things -- watching a football game or going out for ice cream -- mean so much. Almost everyone also mentions Warriors' Walk. I had heard about this place for the past two years, but only visited it this month. Trees stretch along both sides of Cottrell Field -- ironically, the same field where soldiers are welcomed home when they return from deployments. Red buds are planted on each side, one for each soldier from the Third Infantry Division who has died since Operation Iraqi Freedom began in 2003. At the base of the trees, American flags often appear, along with flags representing the soldiers' units. A small concrete marker bears the name of each one. Often, families leave behind mementos: photos, a bottle of favorite beer, a toy tank, a crystal angel. Families linger slowly. Some say soldiers rarely visit here. It may be too sad, or just too scary. It is a profoundly solemn place. As a reporter who covered the Oklahoma City bombing, the eerie feeling I get at Warriors' Walk reminds me of being at the fence erected around the bomb site at the Murrah building. Memorials were set up on the fence for many of the 168 people who died in that bombing. Afterward, Americans traveled from all over the country to leave notes, a stuffed toy or whatever they had to show support for the families of the dead and the hundreds who were injured. At Fort Stewart, it is a more private tribute, but the same sense of grief and sadness comes through. Officials have had to expand the size of the walk as the casualties mount. They've had to pour more concrete and curve the path around itself, and each month, they add more trees. Now, nearly 300 have been planted. At night, a small spotlight casts a glow on each tree. I shuddered as I walked along, feeling the ghosts in this place.